Played some God of War 2 recently and the game screams awesome from every orifice. 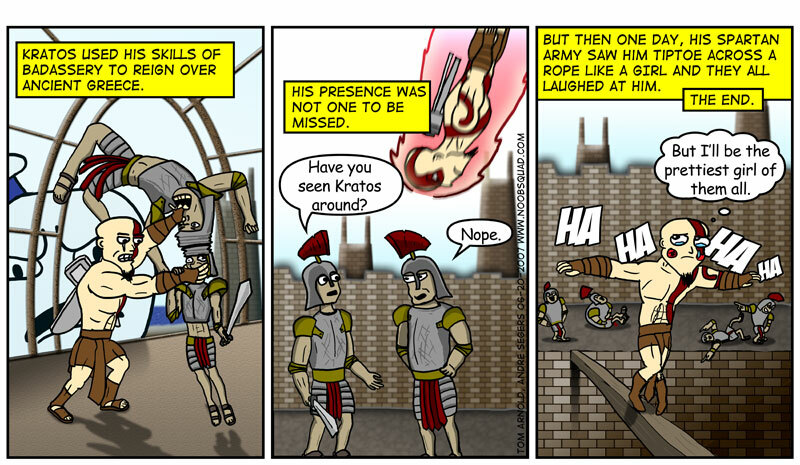 That is until that point where the normally ultra-manly Kratos walks across a skinny railing like a girl. Kratos’ animations are often so far over the top it’s like the developer tried to launch him into space but he tip toes across narrow bridges in the most uncomfortable of fashions. This is supposed to be a person who isn’t afraid to be thrown around in the sky while fighting on the backs of griffins. Andre convinced me to purchase Pac-Man: CE the other day after I got back from my vacation. However, despite how impressive the game is for only being Pac-Man (think Geometry Wars…but with Pac-Man, pellets, ghosts and pixellated fruit) I believe Andre had foul intent in mind. For you see, he lost the battle of the high-score in Geometry Wars and Jet Pac. This time he has hired cheap labor, rumored to be one or several eight year old boys, to set him on top. His downfall can only lead to “playing” WoW and having his gaggle of eight years olds mine gold for his characters. Here's the thirteenth installment of Andre's magnificent Mario RPG pixel opus.